Beetroot, Oxalates, Parasites and Cancer Cells | Nanay Miriam's "re-MISSION"
Oxalates and oxalic acid causes a burst (activation) of phagocytes. Phagocytes eat foreign bodies (including bacteria and cancer cells). After Nanay’s surgery, she took a 42 day juice feast based on Breuss Protocol. The juice is based on beetroot, which many try to avoid like the plague because of their lack of understanding of oxalates, oxalic acid and its role in our body’s metabolism. Oxalate, oxalic acid its metabolite, is overly demonized by many. I respect Rammiel Nagels stand about curring tooth decay using non-invasive and natural methods and that it is true that oxalic acid neutralises calcium. However, he did not specify that the calcium being neutralised by oxalic acid is the free calcium (the non-asborbable kind of calcium that blocks our arteries and are’nt good for our health- sometimes they call it excess calcium). Of course, anything in excess, even if it is a good thing, is not healthy. Benefits of Raw Foods (which includes the raw beet juice)While oxalates are generally considered a negative factor in foods for human consumption, they may also have health advantages. Oxalate can trigger a burst of beneficial phagocyte or white cell production that helps fight microorganisms and foreign particles in the body, according to researcher Mahmut Caliskan at the Mustafa Kernal University Department of Biology in Turkey. Foods rich in oxalate are also full of other nutrients that may be lost in cooking. Antioxidants, B vitamins and vitamin C are dissolved into cooking water when high-oxalate vegetables like spinach or sweet potatoes are boiled, according to the University of Idaho. Individuals unconcerned about oxalate intake may benefit from eating high-oxalate foods raw. I have reason to believe that the 42 day juice feasting on raw beet juice helped Nanay a lot, particularly leading her into remission. Now all the pieces of the puzzles are coming together. Raw beet juice have enough oxalate and oxalic acid which promotes the profileration of phagocytes. There are several forms of phagocytes, one of them is macrophages, which I have already blogged about last year (macrophage eating cancer cells). The problem with macrophage or phagocytes is that they need to be activated by some enzymes. It is suggested in this study that oxalate/oxalic acids in beet roots causes a burst (meaning activating) the phagocytes (which includes the macrophages). Once activated this phagocytes start to eat foreign bodies (including bacteria, worms and cancer cells). How wonderful is that? Food that activates our own immune system to fight foreign invaders. Dr. Hulda Clark’s bowel protocol includes taking Betaine HCL a supplement extracted from beet root. Why beet root of all ingredients? She probably do not know it, but beet root is rich in oxalate/oxalic acid, so its very effective in dealing with parasites. There were also anectodes in Curezone, that tells of people expelling worms after fasting on green juice (meaning raw vegetables- even those that are low in oxalic acid), like romaine lettuce juice. Gerson therapy consists of lots and lots of green juice. Gerson probably knew by instinct that alkalizing greens help cancer patients, but at that time did not see the correlation between oxalic acid and phagocytes yet. Maybe the reason why Dr. Hulda Clark thinks that cancer is caused by parasites is because, all the food that kills parasites seems to kill cancer cells too. But what they dont realize is that the phagocytes have a role to play in this. 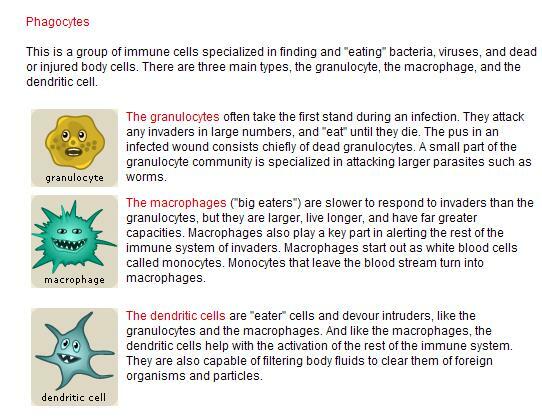 GRanulocytes eat larger parasites like worms. While macrophages, eat cancer cells. Some people on herbal parasite cleanse, thought their clease was not successful when they dont expel worms. COuld it be that the worms have already been digested by the granulocytes so when they pass them, its no longer distinguishable and are only bits and pieces of what they once was. Did your nanay had the exact breuss juice formula (like Biotta Organic) or home made beetroots juice alone? Thanks. Hi sel we juice the breuss recipe ourselves, but if u are too busy, I guess Biotta is better than nothing, i also have to add juice fasting should be done only after or during bowel cleanse, kidney cleanse and liver cleanse, juice fasting can overwhelm ur system and send toxins directly into the bloodstream if u dont do it properly, pls contact PBCN also for more advice. Nanay’s Gold Cubes – The best way to take Curcumin | Nanay Miriam's "re-MISSION"